What, you may be wondering, was I puzzling over? This book. The Inquisitor’s Apprentice, which was just sent to me by the lovely people at Harcourt. Because it is (get this!) a fantasy novel set in an alternate-version of turn-of-the-century New York, featuring a young Jewish boy, a rabbi’s-nephew no less. It is full of dybbuks and Thomas Edisons and Wobblies and Houdinis and Immortals and kugels and rabbis and magic magic magic. Excited yet? It is a GOOD book. Kids will love it. It’s well written, but THRILLING! It’s fast-paced, but has the literary-esque allure of a historical novel. Kirkus has starred it, and evidently it was a “big book” of BEA this year. And really, I thought it was a delight to read, on so many levels. I did. And I ADORED the conceit at the heart of the book– that machines/industry are replacing magic, because they can be more easily monopolized by CAPITALISTS! That’s right, kids! Captains of industry killed off the magic to make a buck. Workers of the World, UNITE and reclaim your fairy tales! It’s a good book. Yes, it is. But there was something, something, and I could not put my finger on what was bugging me about it. It wasn’t the writing or the plot. It was a logic thing, or a religion thing, or a Jewish thing. It was in the ideas, And I could not STAND the idea that what was bugging me was simply that someone had manipulated my own religious culture to make a Harry Potter type book. I didn’t want that to be the truth. At first I just thought it was that the religious world of the “average Jew” on Hester street didn’t have enough of a connection to the magic in the world of the book. I thought what was bothering me was that the “Kabbalists” who made the Jewish magic were part of the Jewish/everyday world, and yet, the Jewish/everyday world didn’t seem much affected by the magic they made. That bugged me a little. It seemed like sloppy world-building. But that wasn’t it. Not quite. But that wasn’t it either. Not quite. Then– last night, lying in bed, I realized that my problem is not with the Judaism in the book, but with the OTHER RELIGIONS. See, this is a book set in a world that, much like our world, values pluralism. Chinese Immortals coexist with Kabbalists. Streganonnas run around with conjure-men. There is small magic and big magic, and some of it is rooted in religious culture, and some of it isn’t. Meanwhile, the religions themselves continue to plug away, doing their thing. It’s fun! It’s exciting! The Irish have their place in Hell’s Kitchen, and the Streganonnas keep to Little Italy, and the Kabbalists rule Hester Street, and the Immortals dwell in darkest Chinatown. Meanwhile, the Capitalists are trying to do away with magic, so we’ll all buy their machines. It is, actually, and if the book had a POV that wasn’t so closely placed over the shoulder of an orthodox Jewish kid, I’d buy it completely. But here’s the thing– traditionally, rabbinic Jews don’t believe in other people’s religions. So I have to wonder at how to accept a traditional (mother hurries to market to make Shabbos before sundown, uncle is a storefront rabbi, etc) Jewish understanding of the world that allows for Immortals who live forever. Wouldn’t that create some inner conflict? Wouldn’t that be confusing? When this kid made his bar mitzvah, and sat down to really ponder his place in the Jewish world, wouldn’t he be a little curious why, if there’s only ONE GOD, all these other people are able to live forever and hex people and stuff, using the magic that extends from their own religious cultures? I’m not saying this book is bad. Not at all. I’m just saying that it raises a question, a complex issue. The book stumbles into faith. And doesn’t, so far as I could see, really address it. Theology is tricky, and when we seek to weave a fabric of it, we end up with tiny knotted threads. So here we have an orthodox kid, too Jewish to enjoy the street food at Coney Island, but despite his frum background, he feels no threat or confusion from the intense, obviously REAL magical forces of other faiths that are NOT SUPPOSED TO BE TRUE. History lesson: Once upon a time, Judaism was a monolatry (or some folks suggest that this is the case, anyway). The Israelites basically decided not to worship idols, and to instead believe in the one-and-only-god-of-the-Jews. But at first, they allowed that maybe other people had other gods of their own. After a bit, they changed their minds, and decided everyone else was wrong, and worshipping fals gods. So now for a long long time, Judaism has accepted (whether you or I or the Jews you know actually think this anymore) that there is only ONE GOD FOR EVERYONE. This is the difference between monolatry and monotheism. In the end, The Inquisitor’s Apprentice works in an alternate realm where Judaism remained a monolatry. It doesn’t work for a monotheistic Jewish world. Not for me. Not really. And that would be fine– if it were made clear. But that would be a much BIGGER book, maybe? Now, will anyone else care about this? I doubt it. Should kids read this book? YES! But I had to think this out, for myself, and the topic is of interest to me–this issue of what happens when we tiptoe into traditional theology and faith as outsiders. I love books that dwell in this realm. I love faith as a setting, as a character. But it’s not easy to do, is it? I know it scares me, personally, as a writer. This is why I am often heard to complain about religion-less “Fallen Angel” books. Because I think a lot of them are trying to reap the “intensity” of the sacred/profane dynamic. Trying to get some mileage out of faith, without ever actually engaging it. Or doing their research. 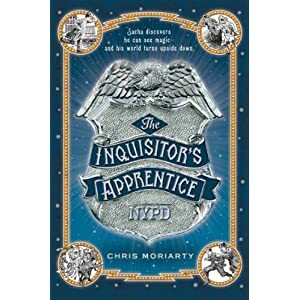 This book, The Inquisitors Apprentice, does NOT make that mistake. It engages! It attempts! Chris Moriarty did her research. I’m impressed, so impressed, with her project. But I’m still confused by the religious life of the characters in this book. This entry was posted on Wednesday, June 1st, 2011 at 8:35 am	and is filed under Blog. You can follow any responses to this entry through the RSS 2.0 feed. You can leave a response, or trackback from your own site. But aren’t you parsing the difference between orthodoxy and practice? Dybbuks have no more place in the kind of monotheistic Judaism that would not allow for the possibility of monolatry than monolatry itself. Dybbuks, and most of that kind of Eastern European Jewish magic — which ain’t Kabbala — is syncretic stuff. Just like the glass stomp at weddings — that’s Polish folk custom. Etc., etc. But of course, it’s all there. Rabbis can make talmudic arguments for hasidic stockings, ignoring the fact that they’re aping Polish nobility. Most Jews believe in ghosts, many believe in UFOs, and some even believe Netanyahu. Religion is a mess — so the book sounds like an accurate representation. Maybe! Totally possible. I know less about this stuff than you do for sure. I’m just trying to muddle it out. So then maybe the author intends to suggest that the magical aspects of all these faiths are not essential to the faiths themselves? But I don’t think that’s the case. I think we’re to understand that all these faiths have their magics… and that they can be used for good or for evil. I think, in the end, it just felt weird to have this book placed so deeply in a religious culture, without much attention to the faith itself. Not that I’m sure exactly how you’d do that.